Spring is coming and soon there will be a big burst of nourishing "weeds" to gather. Preserving fresh herbs and roots in vinegar is an easy way to capture their nourishing goodness. It's easy too. All by itself, vinegar helps build bones; and when it's combined with mineral-rich herbs, vinegar is better than calcium pills. Some people worry that eating vinegar will contribute to an overgrowth of candida yeast in the intestines. My experience has led me to believe that herbal vinegars do just the opposite, perhaps because they're so mineral rich. 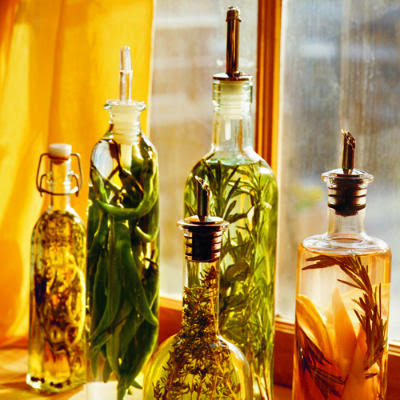 Herbal vinegars are especially useful for anyone who can't (or doesn't want to) drink milk. A tablespoon of infused herbal vinegar has the same amount of calcium as a glass of milk. Vinegar has many powers: it lowers cholesterol, improves skin tone, moderates high blood pressure, prevents/counters osteoporosis, and improves metabolic functioning. Herbal vinegars are an unstoppable combination: the healing and nutritional properties of vinegar married to the aromatic and health-protective effects of green herbs (and a few wild roots). Herbal vinegars don't taste like medicine. In fact, they taste so good I use them frequently. I pour a spoonful or more on beans and grains at dinner; I use them in salad dressings; I season stir-fry and soups with them. This regular use boosts the nutrient-level of my diet with very little effort and virtually no expense. Sometimes I drink my herbal vinegar in a glass of water in the morning, remembering the many older women who've told me that apple cider vinegar prevents and eases their arthritic pains. I aim to ingest a tablespoon or more of mineral-rich herbal vinegar daily. Not just because herbal vinegars taste great (they do! ), but because they offer an easy way to keep my calcium levels high (and that's a real concern for a menopausal woman of fifty). Found you on twitter!! Love your blog. Love this idea and it is so pretty also. What kinds of herbs do you use?? I need ideas!